The road to the 2020 Tokyo Olympic Games has been a rocky one, but now, during the time of year when the games are planned to be held, the extreme heat has many thinking of ways to prevent references to a “death toll” while looking back on the 2020 Games. One plan that the Environment Ministry is currently floating past people is a variation of the Cool Share initiative. Essentially the Cool Share program is a way for people to easily find public air conditioned spaces to visit rather than staying home and using theirs. Additionally, during the marathon events of the 2020 Olympics, the Ministry is looking into whether shops and office buildings are willing to run their air conditioners while opening doors and windows in the first floor to let the cool air waft out into the blistering heat of the street. This isn’t such a radical idea in Japan where shops have been known to do this to entice passers by. In fact you might even find the occasional small business with an AC unit installed on the front. However, this Olympic-sized plan is far more ambitious. In addition to scheduling an early start time of 7 a.m., they are considering having as many workplaces and businesses located along the course as possible turn on their air conditioners and the same time and open their doors and windows to help cool down the spectators. Netizens, on the other hand, had a much different opinion. Although full of passion, these comments don’t go into detail about the inherent flaws of Cool Share. First off, even with the apparent energy efficiency Japanese air conditioners often boast, the power consumption for such a large scale plan would be off the charts. Also, despite their name, the Environment Ministry appears to have a poor grasp of how air conditioners work. They seem to think magic ice pixies turn the air cold, but in actuality the ice pixies’ magic is still bound by the laws of thermodynamics and don’t eliminate hot air. Rather they remove it from the users’ area and put it somewhere else. Anyone who has ever walked past the side of a building, truck, or car, will no doubt have experienced this in the form of a blast of hot air enough to temporarily shut down certain brain functions. To give a better sense of how all this would work during a marathon Cool Share, we ran a computer simulation on our state-of-the-art systems and came up with this theoretical cross-section of the marathon route. As you can see in this diagram, in order to produce the desired effect, the ACs would have to be cranked obscenely high, causing those inside the buildings to experience unusually frigid temperatures (1). Meanwhile, those who have come to the marathon route to watch about a tenth of a race that they could have easily seen in its entirety on TV, will be treated to pleasant conditions (2). The runners themselves would only get minimal benefits from this, but anyone who takes part in a marathon is an inherent masochist anyway, so it shouldn’t matter much to them (3). 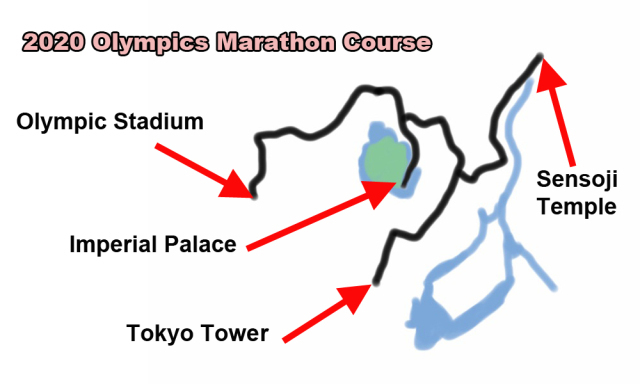 The rest of Tokyo will experience the usual intense heat (4), but on the outer perimeter of the course. The cumulative exhaust of all those air conditioners would create what a “dead zone” (5), which is so hot that only ghosts and space bears can survive in it. Furthermore, when looking at the marathon, there appear to be several partially enclosed segments. In conclusion, the Cool Share solution to the Olympic heat problem is recklessly wasteful at best, and we should avoid it altogether and just hold the darn race at night. What a stupid idea! They are getting desperate though so maybe..just maybe...they may come to the logical solution of changing the date or having events at night. Night events would help ease the burden of the morning commutes and could create a stunning backdrop through illumination and fireworks. They must be joking. So many things wrong with this stupid idea I don't know where to start. I agree people should turn on their air conditioners during these heat but open their doors to cooling down their surrounding, well try water sprinklers. And is the government going to cover the costs of air condition the outside world? I love the diagram explanation in this article. This is about the stupidest idea I’ve heard so far as to how to keep people cool in the middle of the deadly heat. This suggestion is akin to throwing good money (air conditioner bills) after bad (having the Olympics in August in Japan). August was stupid timing in the first place. This totally ticks me off every year...while people are sweltering in 28C office spaces, on a short walk in Center Gai in Kobe you see dozens of shops blasting the air conditioning out into the street. Cool is is a total joke, and so is this. Thus admitting that they have chosen the wrong time of year to hold the Olympics. How about holding the Olympics somewhere more suitable or at a more suitable time of year? Doing any kind of sports where the temperature is around 40C and there is very little oxygen is not going to allow for any new records, is it? How come the "organisers" who are supposed to be thinking of these things are not doing their jobs? Is this a joke? How about planting more freaking trees? Have the Olympic late April or early May. Beautiful season in Japan with suitable temperatures for outdoor sports. Statistically, 03:00 is the coolest time of the day. While it would be still humid, the pavement temperature would be at its lowest and the race would be over before the sun rises to bake both participants and spectators alike. I say start it then. Why not? Just move it to October. Qatar just moved the Football World Cup to winter for the first time - there’s your precedent you can hide behind to ‘keep face’. Why not just design a "Keep cool" mascot? That will be cheaper, better for the environment and more effective. Have they not heard about heat islands? one of the reasons Tokyo is so hot is that aircons pump heat from inside buildings to the outside where the runners are. Another idea would be to introduce summer time (daylight saving). I agree, but there are three letters for why that won't happen: NBC. There's no way NBC would let a few deaths stand in the way of profits. It was the network, not the Tokyo organizers, who rejected the proposal to hold the games in October. NBC wants to show the games during the summer vacation, and doesn't want to interfere with the NFL season in the autumn. So if any athletes or spectators get heatstroke during the games, it's on NBC's hands. Anything to avoid changing the dates, I guess, even proposing something as absolutely stupid and insane as this. They are aware, are they not, of the massive amount of heat this would give off and lock in the air above Tokyo? You can,t be serious, this is the solution? Doesn,t the Ministry of Environment have any senior bureaucrat who can think straight ? The best line in the whole article that sums it up perfectly. No, it's on Tokyo's hands for lying about its "suitable" climate conditions in its official bid. They're called "the summer games" for a reason. If it weren't for NBC and other corporate sponsors and all their money, the Olympics wouldn't be nearly the global phenom it is, and Tokyo and others wouldn't be so interested in hosting it. The sound of sucking teeth in these meetings must be deafening. Genuine question - is the blessing of NBC really so important these days? The USA only has 5% of the world's population and the wealth and influence of China, India and other Asian countries is increasing. It's noticeable at recent sporting events such as the World Cup that the importance of traditional western sponsors is decreasing. it's on Tokyo's hands for lying about its "suitable" climate conditions in its official bid. Do you really think anybody believed Tokyo's claims about its climate? You can find this info on the internet in less than a minute. Exactly. That's why these corporate people behind the whole Olympics racket are responsible for what happens. Ditto Qatar and FIFA. It's all about money. Or maybe not have them in the summer have them in October like they did in 1964!!!! Should be in Sakura season, but maybe TEPCO has a plan to restart everything. Do you really think anybody believed Tokyo's claims about its climate? The IOC did. They chose Tokyo as the winner. So no more setsuden then? The summer of 2020 may not be anything like it is now. Could be hotter or cooler. Who is the tall girl in the picture (second from right)? Unbelievable. Please can you aircondition the outdoors, and pay for it too? Will all the government offices be sharing their cool spaces during the Olympics? I wouldn't mind going in a few and seeing how cheap their taxpayer-funded cafeterias are. fwiw, world records don't happen in Olympic marathons regardless of temperature. The fastest runners will all be there and will run a strategic race to win. For a world record, you need to set a potentially suicidal pace on a very flat course, usually Berlin or London. An Olympic marathon has far too much at stake. World records at other distance events are uncommon at the Olympics for the same reason. They are usually set up with paid pacemakers who drop out. Here's a hint for you Kapuna, it will be hotter. who the hell comes up with this Idiotism? I know: members of the IOC and JOC can get out of their air conditioned limousines, line up along the marathon route, and fan spectators and athletes. I would also note that original design for the new olympic stadium had a roof that could be closed, allowing the interior to be cooled. The JOC scrapped that design in favour of an open bowl, exposing athletes to the baking sun. I predict that later this year, the schedule for the Olympics will be moved to October, like the 1964 Olympics. Reality will set in sooner or later. Or nobody will come. Can’t the athletes and spectators just wear short-sleeved shirts with unsightly designs? Run the marathon in crocs? Serve eel if there are any left? Create a gourd canopy to cover the Olympic stadium? Admit that holding the Olympics at the height of the Tokyo summer is a damned stupid idea? That sounds like an environmentally sound idea... aircondition the outdoors. This whole debacle has been a colossal waste of money, and is going to be remembered as one of the worst ideas Abe ever forced on the country - not quite up there with constitutional revision, but still top five. Maybe they should just give out free chilled bottle water at the events. Could be more effective than hoping the air con makes it across the pavement. Did the Cool Share model take into account it could be a windy day? The electric bill is going to be through the roof. Someone is going to come up with the bright idea to line the running tracks and streets with cold mist machines or piping.